These Three Laws help owners identify what is important to them about legacy—well before they reach exit. Then, once you know, what’s going to be important for you to accomplish—or avoid—at your exit, you can take steps now so that you are prepared when you do finally reach your one-yard-line. 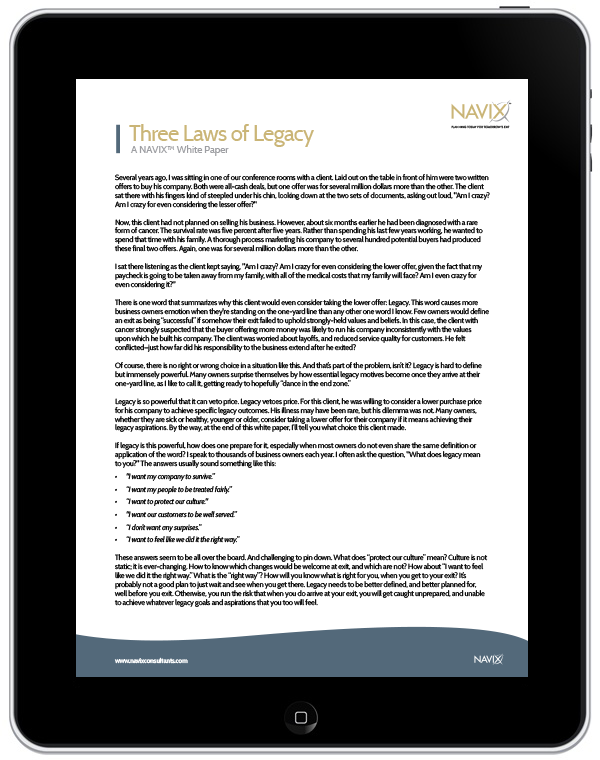 Applying the Three Laws of Legacy gives business owners a framework to approach an issue that is immensely important to the overall exit plan. As you get closer to your exit, you likely will find that addressing legacy goals is very important, perhaps even to the point that whether or not you exit happily is determined by the legacy you leave behind.